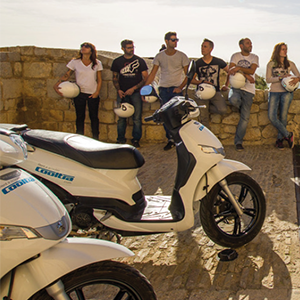 Cooltra gives you the possibility of offering your employees a new and completely different activity: scooter tours across the main destinations where we operate, such as Spain, Italy and Portugal. 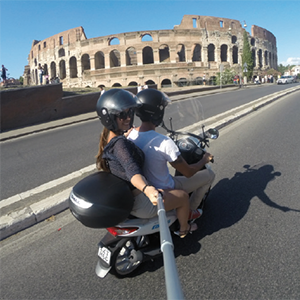 Our guided scooter tours for business are a unique, safe and unforgettable opportunity to discover your destinations. And they are all inclusive! All our guided tours and scooter routes can be customized, whether regarding the times, the places to visit, or the departure and completion points. We would like to remind you that we speak all major languages, so feel free to ask us any questions or request any information you may need. This tour will make you a true Barcelona connoisseur. Cooltra offers an exciting way of discovering Barcelona from a completely different perspective. During the tour you will visit some of Barcelona’s most important sites, such as the Sagrada Familia, La Pedrera, Casa Batlló or Montjuïc Palace, covering the city’s most interesting and colorful places on board a scooter! Not the first time you visit Barcelona? Do you already know the city and its main attractions? 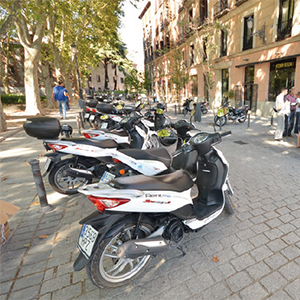 This tour will show you sunny Barcelona, its beaches and Paseo de las Palmeras so you can explore the city in a different way while riding a scooter! Rediscover Barcelona and fall in love again with the beauty and diversity of this incredible city. Madrid is one of Spain’s most popular destinations and one of the best-known urban tourist centers in Europe. If you’re short on time, we recommend you ride one of our scooters and discover Madrid’s beauty in one single tour. Enjoy the Cooltra experience and see the city’s most iconic monuments in only 3 hours. 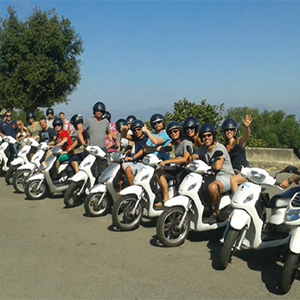 This guided tour allows visitors to explore the city from a unique and very comfortable perspective, on board a scooter. The Valencia Express Tour gives you the opportunity to discover Valencia’s most iconic sites with a fun tour. This tour has been designed for those who want to discover the secret side of Ibiza. This scooter tour will take you to the island’s most unspoiled and untouched areas, visiting an ancient oasis and some of the most beautiful beaches in the vicinity. We will travel from one side of the island to the other, covering off-the-beaten-track sites. Participants will discover the natural beauty and the secrets of this magical island. With all the charm of local pine trees, olive groves, crystal clear waters and panoramic views, this tour will give you enough time to feel Ibiza’s fresh air, tranquility and bliss. Ride to the walled city’s highest point and admire the buildings that have been listed as UNESCO World Heritage sites. 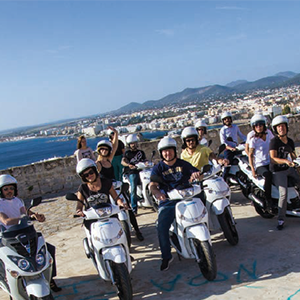 Participants will also be able to visit the most iconic monuments in Ibiza’s oldest town: Dalt Vila. This tour will conclude with a visit to Las Salinas Beach, a truly beautiful place where you can relax and swim in crystal clear waters. A tour created for tourism lovers. 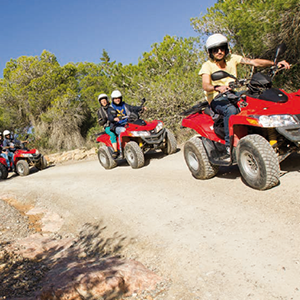 With this tour you will be able to enjoy our heavenly beaches on board a scooter and discover the genuine atmosphere and historical charm of a traditional Mallorcan village while also admiring stunning views of the mountains. You will visit the mysterious Cura Monastery, located atop Puig de Randa, from where you will be able to admire Tramuntana Mountain and the best views over this magnificent island. Route: This tour is not about an established or fixed route. We leave the Cooltra shop located on the same port of La Savina and start roaming the quiet roads that cross the island. During the tour the group will visit two beaches in the way to La Mola lighthouse on the southern tip of Formentera. In the way back, the tour will stop to see a typical hippie market and end up back at La Savina. 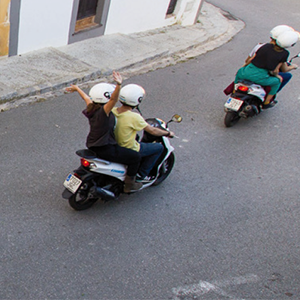 Cooltra offers a complete tour of the island, visiting its most iconic sites – such as Cala Saona and Faro de la Mola – while riding a scooter. The group will take some time to relax while savoring traditional ‘montaditos’ and then set off to Llletas, considered one of the most stunning places in the Mediterranean. This tour will take us through the history of Arab Granada while exploring the city’s most beautiful nooks and crannies. We will be guided through the Granada that was imagined and designed by Emperor Carlos V, on the narrow, steep streets of the old Arab quarter, to admire the finest views of one of the most fascinating monuments in the world – The Alhambra – and we will then venture into nature by exploring the beautiful Gitano del Sacromonte and its Abbey. We will explore this incredible city on board an electric scooter and, if you wish, we will wrap up the Tour with a genuine flamenco show in a Sacromonte ‘cueva’. Are you going to miss out on this? Discover Granada in a different way! This tour has been created for small groups that want to explore Rome’s masterpieces with no pressure and without wasting time in queues. This two-hour tour will take you inside the Colosseum, the Roman and Palatine Forums, and the wonderful treasures of the Eternal City. The tour includes a guide and special ‘quick line’ tickets to visit the Colosseum and the Roman and Palatine Forums. This tour will take you to St. Peter-Vatican Square, the Sistine Chapel, the Vatican Museums, and the wonderful treasures of the Eternal City. The tour includes a guide and special ‘quick line’ tickets to visit St. Peter-Vatican Square, the Sistine Chapel, and the Vatican Museums. You will be able to experience two incredible days in Rome and a special 3+5 hour tour where you will visit the inside of the Colosseum, the Roman and Palatine Forums, plus St. Peter-Vatican Square, the Sistine Chapel, the Vatican Museums, and the Wonderful treasures of the Eternal City. The tour includes a guide and special ‘quick line’ tickets. This fantastic tour will guide our visitors through the city’s most beautiful sites. After this scooter tour, every participant will become a true local. Cooltra offers an exciting alternative for discovering Lisbon from a different perspective. During this tour, the group will visit some of Lisbon’s most important monuments, such as São Jorge Castle, Jerónimos Monastery and Torre de Belém – which are some of the most interesting and colorful sites in this wonderful city. We are very proud to have organized more than 1,000 tours. In addition to the scooter tours for business presented here, we also offer different scooter activities or customized tours. We work with multilingual professional guides who ensure the safety and fun of all our customers. Contact with us and we will tell you about all our scooter tours and activities.